Objective: To identify risk factors for failure of conservative treatment for acute cholecystitis and thus identify earlier patients who will require percutaneous drainage. Summary Background: Current treatment options for acute calculus cholecystitis include either early cholecystectomy, or conservative treatment consisting of intra-venous antibiotics and an interval cholecystectomy several weeks later. Percutaneous drainage of the gallbladder is reserved for patients who have failed conservative therapy or as a salvage procedure for high-risk patients. 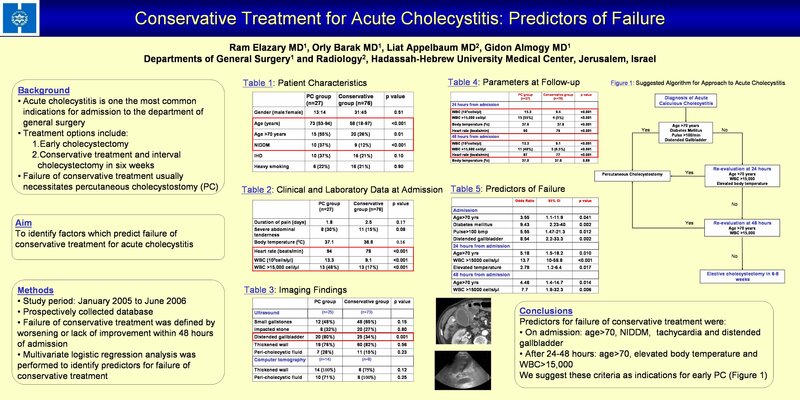 Methods: Data on consecutive patients admitted with the diagnosis of acute cholecystitis was prospectively collected from January 01, 2005, through Jun, 31, 2006. Demographic, clinical, laboratory and imaging results were prospectively collected. Admission parameters, and then parameters at 24 and 48 hours, were compared between patients who were successfully treated conservatively and those who required percutaneous cholecystostomy (PC). Logistic regression statistical analysis was performed to identify predictors for failure of conservative treatment. Results: The study population consisted of 103 patients (59 females, 57.3%) with a median age of 60 (range 18-97) who were treated for acute calculus cholecystitis during the study period. Twenty-seven patients (26.2%) required percutaneous drainage. Length of symptoms, gender and the degree of abdominal tenderness were not different between the groups. On univariate analysis, age >70 years, diabetes mellitus, elevated white blood cell count (WBC)upon admission, admission tachycardia and sonographic findings of a distended gallbladder were found to be significantly more common in the PC group then in the conservative group (p70, diabetes mellitus, tachycardia, and a distended gallbladder were found to be predictors for the need for early cholecystostomy upon admission (p70 and WBC>15000 were predictors for failure of conservative treatment after 24 and 48 hours (p15000) is a marker for refractory disease and should play a more crucial role in the clinical follow-up and decision-making process of patients with acute cholecystitis.